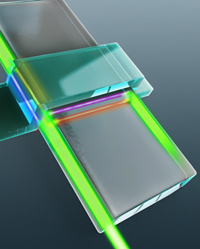 The Majorana particles result in transport channels (red, pink, blue and yellow) in the electronic device, which is consisting of a superconductor (blue bar) and a magnetic topological insulator (grey strip). 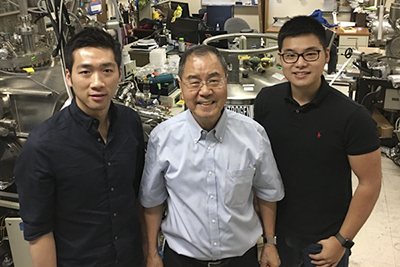 UCLA professor Kang L Wang (center), postdoc researcher Qing Lin He (left), and graduate student Lei Pan near a molecular beam epitaxy system in the Device Research Laboratory. The paper’s corresponding authors include Xufeng Kou, who earned his master’s and doctoral degrees at UCLA and is now a member of the faculty at ShanghaiTech University. The study was a collaboration with Jing Xia, a professor at UC Irvine; and Kai Liu, a professor at UC Davis. Shou-Cheng Zhang, a professor at Stanford University, also participated. By Matthew Chin. Originally posted at the UCLA Newsroom.